WeCyclers work in leveraging communities and generating impact by redistributing the benefits from recycled waste. WeCyclers, a Lagos-Based waste recycling company, has won the 2019 King Baudouin African Development Prize worth €220,000 (N104 million) for its development work in Africa. Herve Lisoir, Coordinator Africa and Developing countries, King Baudouin Foundation, told newsmen on Wednesday that Wecyclers won the prize for its contribution to solving waste management problems not only in Nigeria but Africa. "We selected Wecyclers because we know that waste management is an issue for Lagos, Africa and Europe. We celebrate your innovation, perseverance and keeping it real," Lisoir said. He noted that the prize aimed to acknowledge the work of African persons or organisations which have made an exemplary contribution to development in Africa. According to him, the prize recognises initiatives that improve quality of life and empower local people to take their future into their own hands. Mrs Bilikiss Adebiyi-Abiola, Founder, Wecyclers, said that the organisation has not only shown the people of Lagos the value of recycling, but helped to improve lives and the environment. She said that as a start-up, her passion was about helping to solve the waste challenges facing Africa, and thanked King Baudouin Foundation for its support and the award. 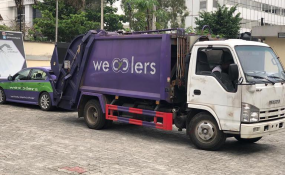 Wale Adebiyi, Chief Executive Officer, Wecyclers, said that it had collected about 5000 tonnes of recyclable waste since 2012, given over $100, 000 as incentives, and have over 17,000 subscribers. He said that the company averaged four tonnes of plastics daily, which did not contribute to ocean pollution and ruin the ecosystem. Adebiyi acknowledged that there were challenges of human capital issues, funding and bureaucracy confronting the recycling industry. He said that there were plans to expand WeCyclers beyond the seven local government areas it presently covers in Lagos, and even go beyond Nigeria. The award was part of the "Silicon Lagoon Mission" that has a team of Belgian start-ups, scale-ups, corporations and NGOs visit different Nigerian companies domiciled in Lagos. The Belgian delegates were led by Minister Philippe De Backer, Belgium Minister of Digital Agenda, Telecommunications and Post Office on a visit which holds between March 20 to 24.